WASHINGTON — Maryland, D.C. and Virginia have declared states of emergency as the area braces for a major winter storm this weekend. By declaring states of emergency, Maryland Gov. Larry Hogan, Virginia Gov. Terry McAuliffe and D.C. Mayor Muriel Bowser authorize state and federal agencies to position resources for quick response anywhere they are needed. A snow emergency goes into effect at 9:30 a.m. Friday in the District, which means vehicles will not be permitted to park along snow emergency routes. “Given the significant severity of the forecast, we will treat this event as a Homeland Security and Emergency Management event,” Bowser said during an 11 a.m. news conference. Vehicles that remain on snow emergency routes will be towed, and the owner will incur a $250 fine, a $100 towing fee and a $25 impound fee. D.C. Public Schools will be closed on Friday, and Bowser says they are recommending that public charter schools in the District be closed as well. See all the closings and delays. 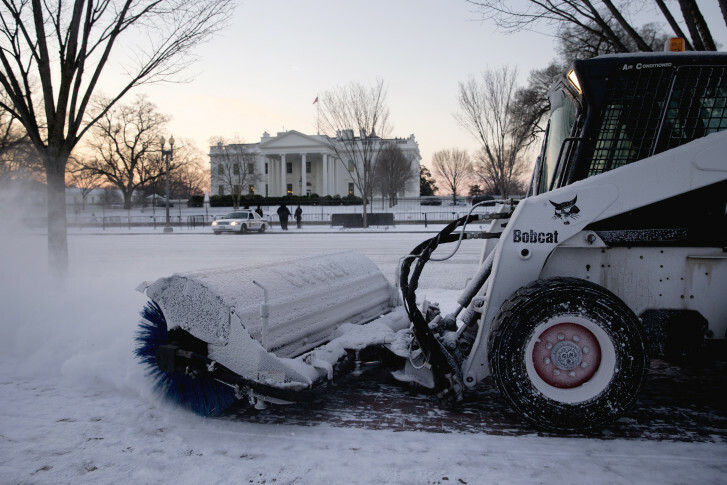 The District of Columbia government will close at noon on Friday, with the exception of essential personnel. “Any time there are sustained winds we also have to be prepared for power outages, and our goal will be to have, if in case residents lose power, to have warming centers, one in each ward, throughout the District of Columbia,” Bowser said. She adds that crews will be out pretreating roads on Thursday. Metropolitan Police Chief Cathy Lanier asks that if motorists are involved in a minor accident with no injuries during the winter storm to exchange information and not call police for assistance. Metro General Manager Paul Wiedefeld says rail service will operate during their usual time, adding that the transit agency will monitor bus service and shut down Metro Access at 6 p.m. Friday. Metro Access will not have any more outbound trips after 1 p.m.
Maryland’s Gov. Larry Hogan announced a state of emergency will go into effect at 7 a.m. Friday. Pointing to a forecast that predicts Maryland will see between two and three feet of snow, the governor says the State Highway Administration is already pretreating roads and that highways will be the priority. “It could take them days, even a week, to dig out local roads. Be prepared and patient,” Hogan said in the press conference. Hogan requested that residents who don’t need to be on the roads stay home and stay safe. “The Statewide Snow Emergency requires vehicles traveling on all highways designated as snow emergency routes be equipped with chains, snow tires or all season radials. Additionally, special hauling permits for commercial vehicles are not valid during snow emergencies. There are 2,700 pieces of equipment are being put into service to respond to the storm and distribute 365,000 tons of salt. “All modes of transportation are expected to be affected with the potential for widespread destruction and delay,” Hogan said of the roads. You are encouraged to keep your cars off the street if you can, so snow plows can make it through. In Montgomery County, all public garages and parking lots will be free from noon on Friday through 9 a.m. on Monday. In a statement, Virginia’s Gov. McAuliffe said that he declared Virginia’s state of emergency based on current weather forecast predictions that could result in downed trees, power outages and blocked roads. According to Storm Team 4, total snowfall accumulations are expected to be around 20 to 30 inches on average for the region. Amounts may be a little higher, around 24 to 30 inches of snow, west of Dulles International Airport to the Blue Ridge mountains. “Keeping Virginians safe in the event of severe weather is our top concern — that is why Virginia began preparing for severe winter weather yesterday by ordering more than 500 vehicles out to pretreat roads in Northern Virginia,” McAuliffe said. The Virginia Department of Transportation says crews are on 24-hour operations and are pretreating roads, when temperatures permit. “VDOT is prepared with crews, equipment and materials to treat roads in advance of the storm and will work throughout the storm to plow roads,” said Transportation Secretary Aubrey Layne in a statement. The Virginia National Guard has been authorized to bring up to 500 personnel on state active duty for possible assistance. The Guard plans to stage personnel at readiness centers along the I-81 corridor between Lexington and Winchester, along the U.S. 29 corridor from Warrenton to Danville, as well as in the areas near Richmond, Fredericksburg and Gate City. Col. Thomas L. Morgan III, director of joint operations for the Virginia Guard, says the guard could assist with transportation through heavy snow, downed tree removal, debris reduction and distribution of food, water and other supplies. “In order to be able to respond rapidly when needed, we will get our personnel in place at key locations before the severe weather hits,” Morgan said. 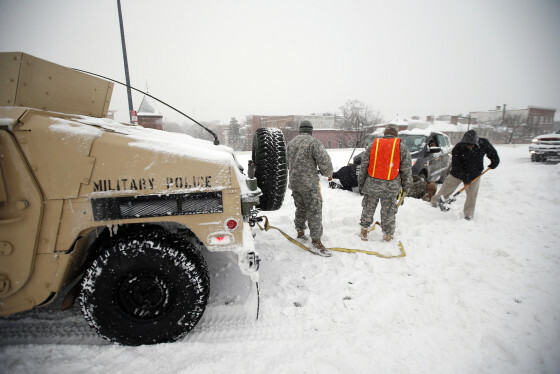 The Virginia Guard last went on state active duty for response operations caused by heavy snow, ice and flooding in late February and early March 2015. In Fairfax County, work crews and first responders are preparing for the weekend. With the expectation of a lot of snowfall, local leaders are urging people to stay home. “The smartest thing you can do is stay off the roads,” says Fairfax County Chairman Sharon Bulova. The county’s emergency personnel will be on duty, to respond to calls, but residents should expect delays because of the snowy conditions.